The detailed explanations of completion stage explain how to then consolidate that experience through further meditation and achieve the ultimate realization of permanent inner peace and the power to benefit all living beings. The appendices include a comprehensive collection of sadhanas and other supporting material for the dedicated practitioner. Outer Pure Dakini Land is beyond the world of ordinary experience. It is the Pure Land of Buddha Vajrayogini and Buddha Heruka. A Pure Land is a world that is free from true sufferings. Nowhere in samsara is without true sufferings, because the samsaric environment itself acts as a condition to experience suffering. Ordinary beings are born in samsara without choice and continually have to experience dissatisfaction and misery. However, if we purify our mind we purify our experience of the world and thereby attain a Pure Land free from all suffering. There are different Pure Lands associated with different Buddhas. 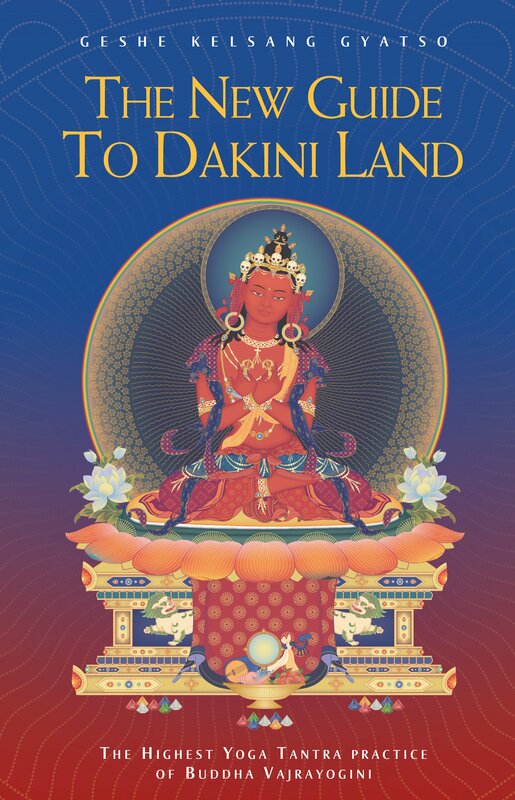 Pure Dakini Land is similar to the Pure Lands of Tushita and Sukhavati, except that Heruka and Vajrayogini’s Pure Land is the only one in which beings can receive teachings on Highest Yoga Tantra and put them into practice. When through Vajrayogini’s guidance those who are very old and infirm reach her Pure Land they will no longer experience the sufferings of old age and sickness. All signs of their old age will disappear and they will be transformed into sixteen-year-olds of great beauty and vitality, enjoying an endless life span. All the enjoyments they desire will appear spontaneously. They will never be reborn in samsara again, unless they choose to for compassionate reasons. Everyone who reaches this Pure Land will receive teachings on Highest Yoga Tantra directly from Heruka and Vajrayogini and thereby attain enlightenment quickly. Outer Pure Dakini Land can also be explained in terms of an individual practitioner’s personal experience. From this point of view we attain outer Pure Dakini Land by completing the practices of the generation stage of Vajrayogini. During our training in generation stage meditation we visualize our body as the pure body of Buddha Vajrayogini, our immediate surroundings as the mandala of Vajrayogini, and our world as Pure Dakini Land. If we engage in generation stage practice continuously, the ordinary, impure appearances to our mind will gradually diminish and finally cease altogether. Once we have gained a firm realization of generation stage we shall experience only pure appearances and our world will be transformed into Pure Dakini Land. The great Teacher Tenpa Rabgyä said that Pure Dakini Land is not some faraway place, nor is it necessary to disappear from this world to reach it. Pure appearances are experienced only by realized practitioners. It is generally accepted in both Sutra and Tantra that the world appears to our mind as faulty, imperfect, and unsatisfactory because our mind is impure – polluted by the delusions and their imprints. In Ornament for Clear Realization Venerable Maitreya says that when the minds of sentient beings become completely pure, their environment becomes a Buddha’s Pure Land. A Pure Land can be attained only by purifying the mind. Even when we have attained outer Pure Dakini Land through a firm realization of generation stage we shall still appear to others as an ordinary, impure being. Ordinary people can-not recognize that another person is in a Pure Land because they cannot perceive that person’s Pure Land and cannot share their experience of it. Someone once asked Milarepa in which Pure Land he had attained enlightenment and Milarepa pointed to his cave. The questioner could see only a cold, empty cave, but for Milarepa that cave was a Pure Land. Because the minds of ordinary beings are impure, whatever appears to them is seen as ordinary. As ordinary beings with ordinary appearance we cannot experience anything as totally pure and perfect. Even an emanation of Buddha appears to us to have faults. It is because we have ordinary appearance that we view ourself and others as imperfect – subject to faults such as sickness and ageing. According to Sutra teachings the root of samsara is self-grasping and the delusions that arise from it. However, according to Secret Mantra teachings the root of samsara is ordinary appearances and ordinary conceptions. The self-grasping recognized by Sutra practitioners is only a gross ordinary conception. In this context, any being who is not a Buddha, and any environment, enjoyment, or body that is not a Buddha’s, is ordinary. Perceptions of these objects as ordinary due to impure minds are ordinary appearances, and the minds that conceive of objects in this way are ordinary conceptions. According to Secret Mantra teachings, ordinary appearances are obstructions to omniscience and ordinary conceptions are obstructions to liberation. Both ordinary appearances and ordinary conceptions have many levels of subtlety. One of the main purposes of practising generation stage meditation is to overcome ordinary appearances and ordinary conceptions. We can overcome ordinary appearances by developing clear appearance of being Vajrayogini, and we can overcome ordinary conceptions by developing divine pride of being Vajrayogini. Because of our ordinary appearances and ordinary conceptions we experience an endless cycle of ordinary death, ordinary intermediate state, and ordinary rebirth. This endless cycle, known as ‘samsara’, must be broken. Through generation and completion stage practice we can purify the three ordinary states of death, intermediate state, and rebirth, and thereby attain the three bodies of a Buddha.